Lease modifications are a tricky part of property management, and should be handled with care. That’s because the language of the lease was carefully drafted or reviewed by an attorney, and lease modifications muddy the waters by potentially limiting a landlord’s rights, or creating contradictions which make the lease hard to enforce. It is much easier to schedule lease updates around the time new tenants are coming in, rather than modifying existing leases. Current tenants will have to agree to the change, and in same cases, the landlord will have to provide something in exchange for the tenant’s consent. Typically, the existing lease requires that any modifications must be in writing. This rule protects the landlord against a tenant who claims the lease was modified verbally. If the intended lease change is minor, your attorney likely will tell you to add it as an addendum to the original lease. This could work for a lease renewal, or to implement a smoking ban, for example. Still, it’s a good idea to re-read the entire lease agreement with that new provision in mind to catch any contradictions. One problem that can arise with a lease addendum is that the language may not mesh with other provisions in the lease. For example, if the addendum allows a pet in a previously no-pets property, check the existing lease to see whether having a pet is grounds for eviction. You may want the addendum to modify that provision, as well, to avoid any confusion. You don’t want to be in a position where you have to tell a tenant to ignore some portion of the lease. Now, let’s say you want to collect a higher security deposit for the new pet. There’s one more modification. The more confusing the lease becomes, the less likely the tenant is to follow it, and the harder it is to enforce. To avoid having to update the lease agreement with minor changes, an attorney may draft the lease is such a way that routine house rule changes can be handled without a lease modification. Major lease changes are those that affect the basic agreement, for instance, when new people move in. In that case, your attorney may suggest starting over with a new lease agreement that names the new tenants and includes their signatures on the entire lease agreement. 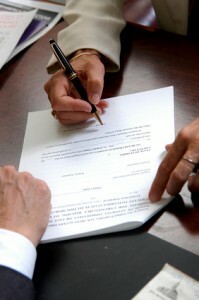 Signing a new lease will affect rights under the existing lease, so consult with an attorney first. It is also important not to use the modified lease as your standard lease offering, unless the changes are intended to apply to all tenants.